Interlaken was part of our European tour. It is located in the Bernese Highlands Region of central Switzerland. We spent the longest there. At first, we all were in agreement we wanted to skip past Interlaken, for any of us have never heard of it before. Our tour guide pretty much told us no and to deal with it. So we decided to make the best of it, and I am glad we did! We took a train from Paris to Interlaken. I was glad to have a window seat and watched the beautiful landscapes pass by my window. We had a little scare when we were interrogated by a very intimidating conductor. We answered his questions with ease and he went away. Whew! After about three hours, we finally arrived. I thought my heart was going to explode out of my chest. We hopped off the train, grabbed our luggage, and headed for the doors. We walked along a path and finally entered the streets of Interlaken. And yes, I did let out a loud "oh my god," because I can (haha). It was late at night in which the streets were quiet. There were water wells on just about every street we turned. A few of us stopped to fill up our water bottles. Probably was the best water I've ever tasted. It was pure and fresh!. We finally reached our hostel called Balmer's located on Hauptstrasse. The hostel was very quaint with two buildings: one for the rooms and showers, the other there was the cafeteria and entertainment. There was a hangout room, cafeteria (in which there was complimentary breakfast), lobby, hot tub, and a downstairs nightclub. Balmer's has three floors of rooms and separate co-ed showers. We checked in and was escorted to our room which held all five of us girls who were on tour. After we unpacked, we all went to a pub down the street called The Three Tells. That is where I had my first beer ever! I was in the best place to have my very first beer, and a Swiss beer at that! The people and bartenders were very nice with me trying to figure out what beer I would try. Do not ask me what beer I tried. I don't remember, but I got pictures. Let's just say I got "turned out" haha. After we had our beers and chit chatted for a bit, we took a short night tour of the small town. You can pretty much see most of Interlaken within a half hour. It is small with a population of 5,319 at 1.7 square miles. We were shocked that our tour guide in such a short time said "that's it" haha. But it was a nice tour and wherever you look there was a nice view of the Swiss Alps. The weather was really nice. This place is in the mountains and does not often have the best weather. For the few days, we were lucky to have nice sunny weather. We woke up in the morning to get a head start on activity planning. First, we ate at the continental breakfast. They had hot food including eggs, sausage, and oatmeal. Also dry food such as cereal and granola bars. I was impressed! We finished up and began to journey down Hauptstrasse to book activities. There were many tour companies along the street that you can walk in and book activities the same day or the next (so don't worry if you don't plan something ahead of time). 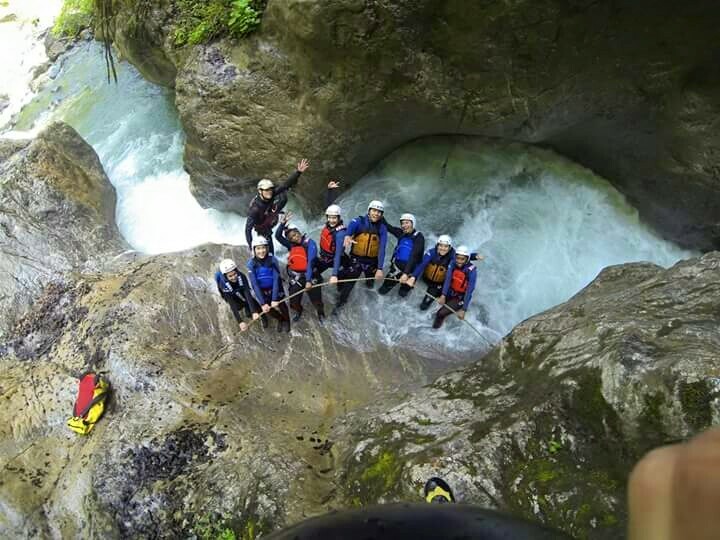 As a group, we booked Canyoning the next day. I ventured out alone and walked into a tour company to book PARAGLIDING that same day! Was I afraid? Yes. But crazy people who are afraid do it anyway. Hello, my name is crazy. It was an amazing experience to say the least. Floating above mountains I've learned about in school; to actually be there flying above them as well? Exhilarating! After paragliding, a few of us rented bikes and took a ride around Interlaken. The people were very friendly, the streets weren't packed, it was a peaceful ride...until we biked up a mountain. It was exhausting! We were able to snap great pictures. There were houses on top of the mountain that looked out of a movie. We stopped at a place called Gasthof Schönegg for a drink and rest, and oh yeah, more pictures. After bike riding, we decided to go back to our hostel to eat. There were a few shops by our hotel of different cuisines, just like America. I decided to get Pad Thai from a spot called Little Thai. It was delicious and very spicy! We had a few drinks outback of Balmer's where you can lounge or sit at a picnic table. Later, we would go to the nightclub located downstairs of the hostel. There was a lot of techno music, not much of pop music. But it was fun! We all wanted to do something as a group, so we booked Canyoning through Outdoor Interlaken which was next door to our hostel. Honestly, I didn't know what I was getting into. A guy suggested that we do it because it was fun. You get to jump in the water of the Swiss Alps? Sold! We walked down the street to Outdoor Interlaken where they gave us our suits and headgear. They gave us a crash course on what to expect, what to do, and not do. We all hopped in a van and traveled up the mountains. But not all the way. We all had to hike up the mountain some more. It was a workout! (I lost about 10 pounds for the entire Europe trip). We finally arrived in the designated area to start our journey down the creek, where we would all risk our lives. But YOLO, right? The activity lasted about an hour. We finally reached the bottom and we were all happy it was over. At this point we were all freezing our butts off, but happy to have done this once in a lifetime activity. There was a guy who actually went again for two hours the next day for his birthday! We got back to our hostel to clean up. A few of us hopped in the jacuzzi at Balmer's (they have it all). It was nice to relax our muscles for such a strenuous activity. Others booked other activities, such as more canyoning, bike riding, and shopping. Later, my tour guide and I decided to take a cable car up the mountains to take in more of Interlaken's amazing views. We walked 10 minutes to the Harderbahn ticket booth to buy our tickets. There was hardly a line and easily paid with my travel credit card. Very convenient. There were a few carts going up and down the mountain. We waited only a few minutes to take the next cart up the mountains. We got on and sat by a window to take it all in. The cart leads to Interlaken's top of the mountain restaurant Harder Kulm. We didn't eat, we only were there for the viewing deck in which we both took our time and took great photos. We bought souvenirs from the gift shop as well. The view was amazing! Everywhere you turned was a postcard photograph. Our last dinner in Interlaken was at Resturante Bären (I believe). We wanted to dive into the fondue. Honestly, I had a taste for some good pasta, but Italy was coming up in our itinerary really soon. Never was a fondue fan, but it was nice to have authentic fondue meal in the motherland of Switzerland. We all shared and dipped away. Don't have any pictures at the restaurant, think I was a bit tired of taking pictures haha. But I did take a snap of my lunch, Swiss chocolate, and the birthday cake! In addition, I felt nonetheless safe in Interlaken. During our tour, our guide told us to relax, and that everyone has their own money and won't rob you (haha). It was nice to not be hit on me walking down the street. In addition, I saw no one homeless. I thought that was great that their country is taking care of their citizens. Interlaken was the highlight of my entire European tour. It was good weather, fun activities, delicious food, and nice people. A few of us were in agreement that we'd visit again and probably longer. Who wouldn't want to wake up to a nice view of the mountains every day? If you are deciding to visit Interlaken: GO! I'd suggest you book the activities that you absolutely want to do as suggested in my previous article. There may find activities with other tour companies along Hauptstrasse. Have fun and taste all the good food! Safe travels! Oh my god! It looks like you had so much fun! I've wanted to visit Interlaken for aaaages and your post has pushed it up the priority list. Thanks for sharing! Beautifully written. Brought back my own memories of Interlaken from last summer. We went there on a half a day trip. So, while we were able to soak into the natural beauty of Interlaken, but we couldn't try some of these activities. Particularly the paragliding. I can imagine how beautiful the experience must be. Yes, that is how you do a trip to Interlaken! I really want to follow in your footsteps. It has everything the Friend's like; Mountainscapes, adventure activities, mountain style good food and Swiss beer. I've driven through Interlaken, but never stayed there. You post has made me want to change that. I don't think I could paraglide, but I'd be up for everything else! This lake is so beautiful and definitely i would try go paragliding there. Not so adventure lover though, but would love to explore some activities here. Very well written. Thanks for sharing . Switzerland is always beautiful! I have only visited Basel, would love to see more of the nature there. Looks like you guys had great fun! Wow it looks like an amazing few days! I'd never thought about going here before but I also never realized there's so much to do. Thanks for sharing! I'm glad the city turned out to be better than you expected. I'm sad we skipped it on our Europe tour. We also had fondue when we were in Zermatt with a bunch of great people and it was an amazing experience. Maybe it's something about Switzerland. The water color is amazing! I'm terrible with geography so I've never heard of this place but it's absolutely beautiful!!! The views from ziplining are just phenomenal too! Although my name's not crazy so I don't think I'd have the guts for it. Will for sure be adding Interlaken to my bucket list though!